Former BJJ World Champion and current Strikeforce contender Andre Galvao is now teaching in San Diego. Galvao who has been in San Diego since the last Strikeforce event will be teaching at Atos San Diego Academy located at 4425 Convoy Street #216 San Diego-CA. Evening classes start at 7:00PM. Online Registration extended! Deadline, August 31st. $97.00 -till Saturday, August 31, 2010. Gracie Miami Brown Belt Miguel Diaz de la Portilla, won a seat to the Florida Senta. Miguel has been training for over 10 ears and will certainly use his BJJ skills to succeed in the senate. He has plans to introduce BJJ practice in the Florida schools! That is great news for BJJ, with more and more serious practitioners taking positions in society can only help the spreading of the art in its bets way. Rey Diogo Black Belt and Sweep wizard Andreh Anderson has released his long awaited Sweeps Instructional DVD. "The Sweep" is a 2 hour DVD that concentrates on solid, high percentage sweeps from the closed guard. The SWEEP: CLOSED GUARD CONCEPTS DVD is Ready to Pre-Order!! Andreh Anderson’s Closed Guard Concepts DVD is finally ready for ordering! The Strikeforce event this weekend in Houston, Tx will have two BJJ World Champions competing in it. 2X World Absolute Champion Ronaldo "Jacare" Souza faces Tim Kennedy for the belt while Andre Galvao goes against BJJ and Chuteboxes Jorge "Macaco" Patino. The entire card is full of top fighters but since Kid is mainly focused on BJJ the spotlight here is on Souza, Galvao and Patino, all three are personal friends and we wish them luck. Go train good Jiu Jitsu "
The next OGC Newsletter will be coming out soon; complete with all the information you will need for our LARGEST event of 2010!!! The 2nd Ohio State Brazilian Jiu-Jitsu & Submission Grappling Championships will be held in Columbus, OH on Saturday, October 30th! Last chance to register with discount prices, August 15th will be the deadline for a lower price! * $82.00 - till Sunday, August 15, 2010. * $97.00 -till Saturday, August 28, 2010. Zebra Mats will once again be providing all of the competition mat areas for this events. And, Zebra will be offering a special discount on all mats purchased from the IBJJF. Contact Zebra at 1-800-989-8085 to reserve your Zebra Grappling mats today. Valente Brothers Fort Lauderdale inaugurated its new 4,700 sqft facilty in great fashion. 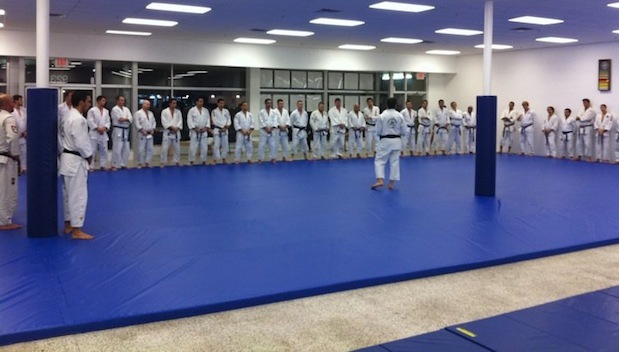 Professors Pedro, Gui, and Joaquim Valente, along with Professor James Robertoson and Fort Lauderdale Chief Instructor Bruce Belfield among several other students had an amazing night in the new facility. Many students from headquarters attended, demonstrating the school’s overall unity and camaraderie. The special class covered an array of Jiu-Jitsu techniques and culminated with a technical and competitive sparring session. The seminar will be conducted by Professor Alvaro Mansor, 5th Degree Black Belt and Director of Referees for the International Brazilian Jiu-Jitsu Federation. Kid wanted to celebrate and pay tribute to a legend. Four and a half years after his early passing ,today Grandmaster Carlson Gracie would've been 78 years old. The legendary member of the Gracie family was a fixture on tournaments and MMA fights everywhere. He had a quick smile and a warmth about him but he was also always just as quick to call anyone on a dispute, be it a referee that made a bad call or even a brother who he had a disagreement with. But he was just as quick to forgive and to embrace. Nothing would give him more pleasure than watching his students perform and win. He was totally dedicated to GJJ and his students. Carlson left a legacy of Champions and top instructors. My fondest memories of the Master was always watching him coaching and encouraging his students and athletes to do better at tournaments and how he'd always call me as "Master" in front of others both showing how humble he was and always eliciting a head shake as I would tell him: "Please Master, don't say that." To all his beloved students and friends Grandmaster Carlson Gracie was and is forever a legend. He is dearly missed. Kid Peligro wants to says "thanks" to Michael Sergi and all that attended his Savannah, Ga seminars. The hospitality and warmth of the south is alive and well! A real special thanks goes to Nova Uniao Black Belt Randy Malacas, who on the eve of his deployment took the time to honor me with his presence: I'll never forget! The Brazilian Jiu-Jitsu Association will soon launch our newly designed tournament site and online registration for the 2010 Thailand BJJ/Grappling Open at Seacon Square (Bankok, TH). We would like to remind all potential brown and black-belt competitors that all tournament fees will be waived and we will host you for 2-days free of charge at the Golden Palace Hotel the weekend of the tournament. Claudio Franca Brazilian Jiu Jitsu Summer Camp just two weeks away! A few weeks ago we broke the news that former multiple times World ladies champion Leka Vieiras is back training. Now we have confirmation that not only she is fully training but will return to the mats this year: "Yes I am getting back into it and my plan is to return to the mats this year" said Leka. Loop Chokes Seminar with "Batata"
The Tinguinha BJJ Academy will be hosting a seminar with Loop chokes expert Sandro "Batata" Santiago. I know it is in Portuguese but a prettycool story about two soccer super stars learning BJJ if only for a few hours as former Player of the Year Kaka and Cristiano Ronaldo from Real Madrid got together with Royce and Pedro Valente Jr. 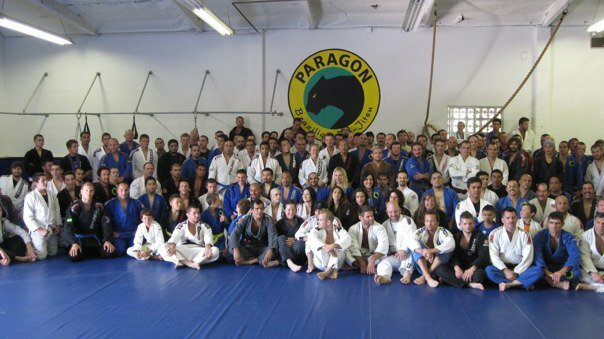 This past Saturday Paragon BJJ Academies held a promotions day. Ricardo "Franjinha" Muller has a load of great students, Bill Cooper and Jeff Glover are known standouts but the list is much longer so this event is not to be taken lightly. BEsides the many promotions of lower belts, "Franjinha" honored 4 of his top students with the rank of Black Belt. The short list is Antony Califano, Dr. Bernard Weinstock, Bill Stalworth and the new Paragon standout Milton Bastos. Bastos won the '09 Worlds No-Gi and the '10 Pan and the '10 Worlds! Follow this link to watch the FIGHT VIDEO! Open to all martial arts schools, regardless affiliation. Don't miss the chance to share the mats with a living legend. Book it now! Kid Peligro Back in Savannah, GA Again!